The Curse of Caine has existed for so long, it has finally begun to weaken. Elders' blood, passed from one childe to the next for generations, no longer holds the potency it once had. Too many childer have been Embraced in the Final Nights - and reckoning must come for these illegitimate vampires. If it does not, the world may end. 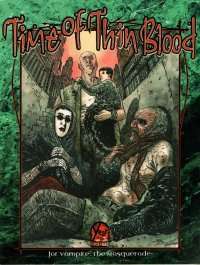 The Time of Thin Blood allows players to portray the hunted childer of high-generation vampires. In addition, the Final Nights are upon us, and this book offers Storytellers a glimpse at one of the first events in the unfolding Gehenna. Rich in story and character content, The Time of Thin Blood is he first step toward the world's ultimate demise ... or salvation.